Monoclonal antibodies and other biological drugs may be produced only if well-defined, tightly controlled, and cost-efficient bioprocesses are implemented. Such processes were highlighted at two recent conferences: Optimizing Cell Culture Technology (part of the Ninth Annual Bioprocessing Summit) and Bioprocess International West. Both meetings showcased technologies and strategies aimed at maximizing the efficiency and productivity of large-scale cell culture. For example, the meetings covered CRISPR-based genome engineering of CHO cells, scale-down modeling, inline sampling, and mobile cleanroom technology. Some of the most interesting approaches are described in this article. At the Optimizing Cell Culture Technology conference, a presentation entitled “CRISPR Tools for CHO Cell Engineering” was delivered by Helene Faustrup Kildegaard, Ph.D., senior researcher, Novo Nordisk Foundation Center for Biosustainability, Technical University of Denmark. Dr. Kildegaard discussed her work on accelerated genome engineering of CHO production hosts to improve the yield and quality of therapeutic protein products. This work, she said, was advanced by CRISPR-Cas9, a system for targeted genome editing. Dr. Kildegaard noted that she has used CRISPR-Cas9 in varied contexts. For example, to enhance the performance of the CHO cell factories, she has used CRISPR-Cas9 to knockout pro-apoptotic genes, which tend to increase in expression under the higher stress conditions of cell culture and activate programmed cell death pathways. Also, she has used CRISPR tools to overexpress genes that help increase the productivity of CHO cells in culture. Finally, she has used CRISPR-Cas9 to target genes that can interfere with the quality of the protein product, such as host cell proteins that degrade the product or its attached glycan structures. “We are also working on introducing genes at precise genomic positions that support high and stable protein expression,” said Dr. Kildegaard. Traditional approaches for gene delivery that rely on random integration provide no control over where or how many copies of a gene integrates into the host genome. “CRISPR is good for targeted integration and optimizing expression of genes,” she asserted. It allows for precise and low-error insertion of one or more copies of a gene at a specific genomic location while lowering the risk of inserting copies that contain mutations. In addition to targeting genes and regulatory elements that can impact the expression levels and properties of therapeutic proteins, Dr. Kildegaard’s group is using CRISPR tools to answer questions about the basic biology of CHO cells. She also described how CRISPR-based methods can be used to develop genome-scale knockout screens for target identification. Using CRISPR, her team generates pools of cells such that each pool has a different gene knockout. Her team also designs screens to identify which genes are associated with a specific phenotype. Manufacturing-scale processes can be modeled at a small scale to facilitate process characterization. This possibility was discussed at Bioprocess International West in a talk entitled “Challenges in Developing a Representative Scale-Down Model.” This talk, which was presented by Shyamsundar Subramanian, Ph.D., director, biologics R&D, Teva Pharmaceuticals, described how a scaled-down model could be used to vary process parameters and study the effects. Using a scaled-down model, Dr. Subramanian advised, can “establish ranges and evaluate criticality.” At a smaller scale, he suggested, it is possible to perform multiple experiments that require fewer resources and rely on automation to achieve high throughput and get more information in less time. As Dr. Subramanian noted, a scaled-down model can never mimic exactly what happens at manufacturing scale. However, the more scale-dependent parameters your model can accommodate, the more rigorous and representative it is likely to be. Scale-dependent parameters include agitation, aeration, mass transfer, and gas flow rate. “Our preference is not necessarily to match P/V or kLa across scale, but to ensure that we are not near any sensitivity limits for the model.” The goal is to identify an ideal operating space to stay within in the model and at scale. For agitation, for example, that would be a level high enough to ensure adequate mixing and to support oxygen transfer, but not so high that it would damage the cells. While product quality is the predominant focus for matching across scales, as companies gain experience with scale-down modeling of their manufacturing process, they may begin to explore beyond the usual set of process performance parameters, such as cell viability and titer, and look at factors such as carbon dioxide and metabolite profiles. Doing so may be necessary if a company wants to match product quality across scales. For example, a company may find that carbon dioxide profile variability influences the sialylation of its product. In the area of process characterization, Dr. Subramanian identified an emerging trend toward additional, intermediate-scale modeling. Whereas a 2,000–20,000-L scale manufacturing process might be scaled down and modeled at 2–10 L, process development groups are increasingly adding a second level of verification at pilot scale (50–200 L) to build confidence in their scale-up or scale-down procedures. This may be especially beneficial and cost-effective as a product gets close to a regulatory filing (process characterization). “You can mimic more things at pilot scale,” asserted Dr. Subramanian. For example, there are more similarities in how steam-in-place sterilization is performed and in the bioreactor design, such as the impellers, vessel geometry, and spargers, and there is also better process control (that is, accuracy in volume of feeds), resulting in profiles that are more similar, especially for gas profiles. “We also like to verify some extreme conditions at that intermediate scale,” he noted. In the context of increasing the level of detail in the scale-down modeling of fed-batch cultures, Dr. Subramanian pointed out the different effects that sampling can have depending on scale. Removing a 200-mL sample for analysis from a 10,000-L bioreactor represents a miniscule amount when compared to the extraction of a 50-mL sample from a 5-L bioreactor, perhaps multiple times a day over several days. In the scaled-down model, you are removing a much higher percentage of the total cell population, and if the feeding amount is not modified, the result can be overfeeding, which may affect the cells’ performance. Furthermore, simply by removing that percentage of cells over time, you are having an impact on how much product is produced. At the Optimizing Cell Culture Technology conference, Flownamics gave a presentation that illustrated how its Seg-Flow® automated platform for sampling and feed control can help optimize process conditions and performance, improving efficiency and minimizing the risk of human error. The Seg-Flow sampling system uses Segmented On-line Sampling™ technology to achieve accurate and rapid sampling from up to eight vessels or process streams, with the delivery of samples to as many as four analyzers. The system can extract cell-free or cell-containing samples to enable online monitoring of nutrient and metabolite levels and cell growth. Also, it can control two pumps per vessel, providing for several feed control options. The segmented online sampling technology utilizes pinch valves to control the capture and transport of small sample sizes. The release of a segment of sterile air into the line following sample capture allows for an increased flow rate to accelerate delivery and purging of the sample, to prepare for the withdrawal of a fresh sample. “Seg-Flow increases confidence that you are getting an accurate representation of what is in the culture at a particular point in time with a minimal sample volume,” said Michael Biksacky, president of Flownamics. 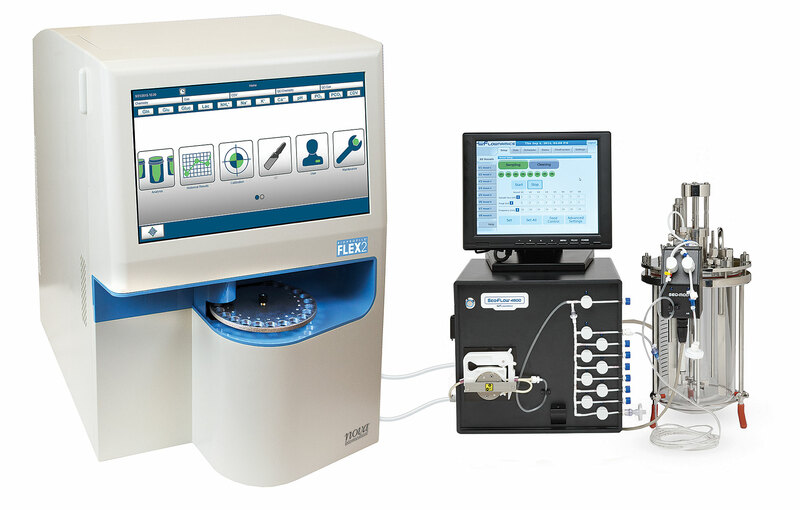 Seg-Flow can be connected to a fraction collector and integrated with industry-leading systems such as the BioProfile FLEX2 analyzer (Nova Biomedical), the Cedex Bio HT and Cedex HiRes analyzers (Roche Diagnostics), BioCommand software (Eppendorf), the Vi-Cell analyzer (Beckman Coulter), and the Raman probes (Kaiser Optical Systems). The Seg-Flow system’s capabilities have been highlighted in a couple of recent poster papers. In “A Novel Approach to Real-Time Monitoring of Antibody Titer in a Fed-Batch Bioreactor Run,” scientists from Aragen Biosciences reported that the Seg-Flow system enabled online collection of a cell-free sample and delivery to a real-time antibody titer prototype device for chromatographic analysis and monitoring of antibody titer. In “Automated Glucose Control for a Cell Culture Process,” scientists from Eppendorf, Flownamics, and Roche Diagnostics described how the BioFlo 320, the Seg-Flow 4800, and the Cedex BioHT metabolite analyzer were integrated using a fully customizable automation program to control glucose concentration. The Seg-Flow® 4800, Flownamics’ automated system for online sampling and feed control, can draw samples from one to eight vessels and deliver each vessel sample to as many as four analyzers and/or fraction collectors. In this image, the Seg-Flow instrument is connected to a 2-L bioreactor and the BioProfile FLEX2, Nova Biomedical’s cell culture chemistry analyzer. Fujifilm Diosynth Biotechnologies (FDB), a division of Fujifilm that operates as a contract development and manufacturing organization (CDMO), has completed the first cGMP batch at its new Texas Biomanufacturing Facility (TBF-100) in College Station, TX. The 80,000-square-foot facility, which Fujifilm redesigned from an existing space, is home to the company’s Saturn mAb Platform™. FDB has also initiated work in its new Flexible Biomanufacturing Facility in College Station. This facility uses mobile cleanroom technology to allow for multiproduct and multiclass manufacturing of advanced therapies, such as gene therapies, viral vectors, and vaccines, at clinical to commercial scale. Thomas Page, Ph.D., vice president of engineering and asset development at FDB, told GEN that the facility opened with three 2,000-L bioreactors ready for operation. He also indicated that he expects three more bioreactors will be added soon. Total upstream capabilities can reach 12 × 2,000 L. Downstream operations are designed to handle small, medium, and large batch sizes, thereby optimizing the consumable costs, supply chain, and resource needs. 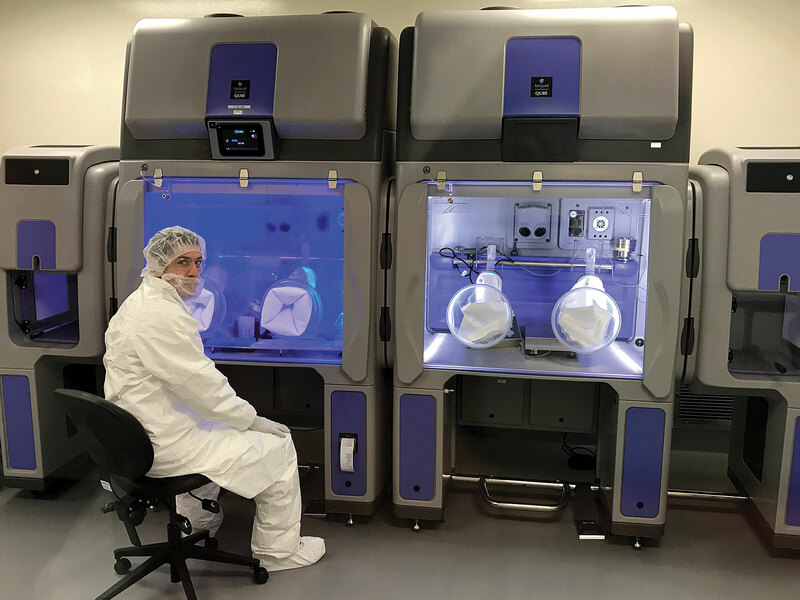 At its facility in College Station, TX, Fujifilm Diosynth Biotechnologies has combined its own Saturn mAb Platform and GE Healthcare’s FlexFactory technology. According to Fujifilm, the facility exemplifies the concepts of process closure and advanced modified ballroom implementation. In this image, an isolator-based system is used instead of a biosafety cabinet for shake-flask inoculation.